The Blekhman Lab at UMN studies the human microbiome — that amazing, complex microbial community that lives in and on us! 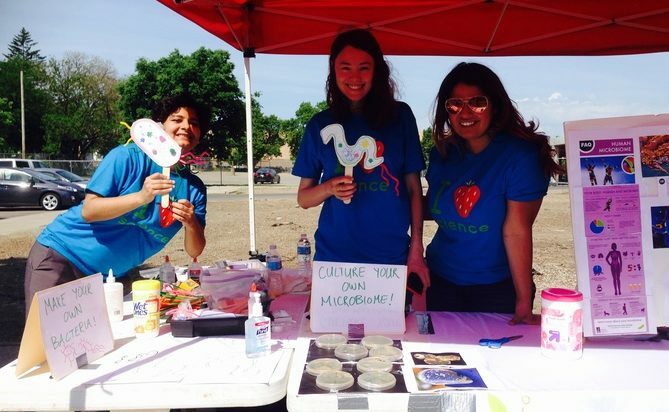 If you visited them at Midtown Farmers Market last Saturday, you got the chance to culture your own microbiome. See the photos below and match up your ID number (e.g., A1, A5) with the ID number in the photo to see how (a portion of) your microbiome looks when grown on an agar plate! There are also some additional lab plates that the Blekhman Lab did to give you an idea of what other microbiome members look like. Next > Plant – Microbe Interactions: Leaf Endophytes!